Maureen was a Mickey Mouse Club finalist at age 11 and from there the stage beckoned. She performed in community events, USO shows and made it to the Ted Mack Amateur Hour in New York. Maureen is trained in classical ballet, jazz, tap, voice and acting. She has had leading roles in musicals at venues such as community theater, dinner theaters, Arena Stage, Lisner Auditorium and the Smithsonian in their Musical Theater Series. 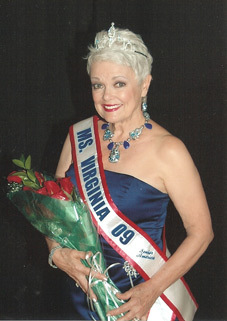 Maureen has had a cabaret act called “Romance of Broadway,” entertaining for D.C. corporate events and special events at the U.S. Capitol. For 25 years, she was the first female soloist for the Gridiron Club and performed at their annual dinner given for the President, politicians and national dignitaries. She has sung and danced for 5 Presidents. Today through the National Theater of Washington, she performs in their Community Vaudeville program. She shares her one woman show "Music of the Greatest Generation" with seniors at community centers, retirement communities and nursing facilities. Maureen feels blessed to share her gift with these special people. 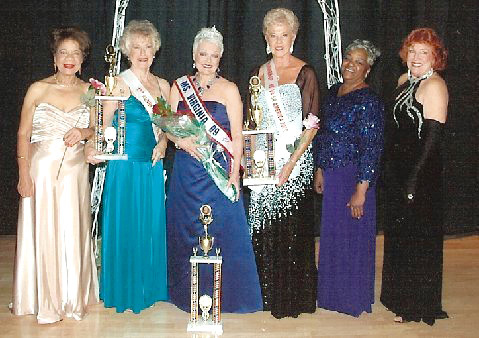 (L to R) Judith Mudd-Krijgelmans; Joan Phillips, 1st Runner-Up; Maureen Ribble, Ms. Virginia Senior America 2009; Diane Roberts, 2nd Runner-Up; Charlotte Allen, Ms. Congeniality; and Sue Athanas.